Rugby Tots Comes To Bingley! Rugbytots is launching in Bingley at Bradford and Bingley Sports Ground (for the summer term, then switching to Beckfoot School). Rugbytots is the worlds favourite rugby play programme for girls and boys aged 2-7. Our energetic coaches and fun, structured play sessions take children on a journey of sporting imagination! Classes are £6.50 per session payable as termly blocks. A warm welcome to Adele Potter, new site sponsor of Bingley Mums and owner of Bingley Birth Therapies. I started taking an interest in the services available to expectant parents after the birth of my own child. In all honesty I did zero preparation for Eva’s birth, I thought that I’d be ok, that natural instincts would take over. Unfortunately I failed to convince my brain of this and didn’t achieve the all natural birth I had pictured. I know now that while the natural instincts are there, there’s a certain amount of preparation needed to be able to access them at the right time. This is what I am aiming to help others to do now by offering a holistic range of support through yoga, massage, active birth preparation workshops and hypnobirthing. I trained in prenatal and postnatal yoga in 2015 and have been providing classes in the area since that time. Prenatal yoga helps mums-to-be to relax and cope with the physical changes to the body during pregnancy while preparing the body and mind for birth. Postnatal yoga helps new mums to regain the body’s strength and tone after birth while bonding with their babies who are included in the routines, these classes also include yoga poses for the babies to aid in their development. I started training in massage in 2016 and am now accomplished in Swedish massage, Pregnancy massage and have recently trained in Warm Bamboo Massage. Offering pregnancy massage to women allows me to provide the nurturing and relaxing aspect in contrast with the physicality of yoga. I found that most mums come back to Massage in the post natal period so I offer the Swedish and Bamboo massages to support them through this time. Hypnobirthing. I trained with The Wise Hippo in 2017 and have been offering private birthing classes to couples in bradford as an alternative to traditional hospital led hypnobirthing courses. I enjoy supporting mums through pregnancy and birth then seeing them return to classes with their babies when they are ready. Most mums stay in touch and have reported what elements of the classes have worked well for them which is great feedback and helps inform other mums as well as shape future classes. Teeny Tumblers class follows the British Gymnastics FUNdamental scheme. It’s a parent and child class for 2-4 year olds held at Beckfoot School on Saturday mornings. We’ve been to many classes and groups over the years, but I have to say that babyballet® is one of my favourites. Many years ago, we used to attend classes with Miss Brianne at Jimmy Gs in Saltaire, and I love the structure of the classes and how interactive they are. So I was pretty pleased to hear that classes are starting up again in Bingley with Miss Heather, and we attended today. Miss Heather has a strong background in dance and is great with little ones – she gets that they sometimes want to run around, and the setting is ideal for that too! The classes are 35 minutes long and take place at St Wilfreds Church Hall in Gilstead. There is on road parking. We went along today and there is plenty to keep little ones occupied including bubbles, teddy bears, instruments, dance moves and great songs. Unfortunately my little girl spent the session running round like a lunatic so I was unable to get many good photos! 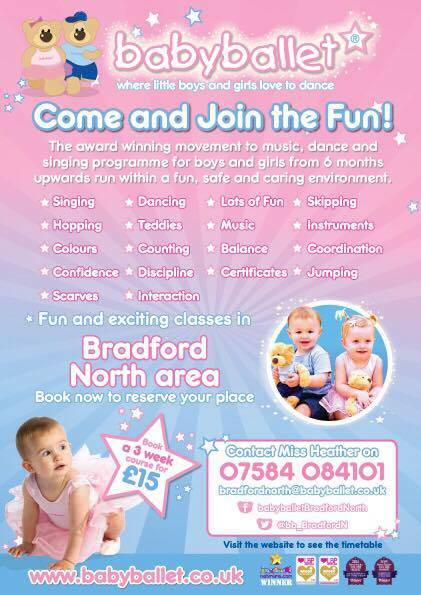 Heather says, “babyballet® is running award winning classes across Bradford North, why not book a trial and come and join in the magic? To sign up either call or text 07584 084101 or message via facebook here. Sign up now while places are available! Baby girl complete with hand print. Bumps and Beyond! We are a brand new friendly baby group whose aim is to help you with all those questions you have as a new parent such as how should my baby develop? when should I wean them? Are they getting enough sleep? Marion and I are both experienced Health Visitors who want to support families at this exciting time. We would like to invite both new and expectant parents to a free introductory session to tell you what we are all about! The group will take place on Monday 18th July at 1:30- 2:30pm at Holy Trinity Church, Bingley (located behind Trinity and All Saints Primary School). We look forward to seeing you all there, refreshments will be provided! Please get in touch if you would like more information by facebook or email jennybumpsandbeyond@gmail.com. Like many parents in Bingley, my two sons have been having lessons with Swim Stars for many many years. To be honest, it’s the one thing I don’t mind spending money on – swimming lessons really are a right of childhood, and there was no way I was going to wait until my children were in year 5. Having accompanied many year 5 classes myself to swimming lessons as a teacher, I always felt sorry for the children floundering in the water because their parents weren’t able to have them attend lessons from an earlier age (I’m not judging – some people I guess genuinely can’t afford it). Aside from the embarrassment factor of not being able to swim, swimming is clearly really good for us all for a variety of reasons – health, fitness, that feel good factor as well as simple survival if the need ever arose! Although I learned to swim as a child, I’m still not really a strong swimmer, and I know if my children got into trouble in the water I would probably struggle to rescue them safely. Another good reason for them to learn to swim to a good standard! We chose Swim Stars because of its good reputation locally, and also due to the simple fact that it was our nearest provider. We did try the council run lessons for a while, but I didn’t think that the boys were making any progress due to the large class sizes so we moved – a good decision! “The Swim Stars story started in 2000 when we were known as ‘C.A swim school’ we started with just 5 swimmers, and have gone from strength to strength, we now have over 800 pupils across our 3 pools…..and we are still growing! We pride ourselves on having some of the best teachers in the area, who are devoted to giving all our swimmers personal attention whilst developing excellent relationships with both children and parents. From the first lessons as a beginner where time is spent encouraging confidence in the water, to mastering the perfect stroke with our more experienced swimmers- we aim to make each lesson as fun and rewarding as possible. It’s worth knowing that lessons also take place at Bingley Grammar school if you prefer. The pool at Hazelbeck is a hydro pool which means it is quite a warm pool and atmosphere – great for the swimmers but worth knowing for parents as you’ll need to wear a thin t shirt during the session for sure! My boys both started at Swim Stars being unable to swim at all – my second son particularly has made really good progress and even though he’s only 5 (Swim Stars take children from 2.5 years old though), he can swim a length under water unaided and is really water confident. My older son has struggled a bit more (it’s just the way he is!) but under the guidance of Louise, he has really focused down to learning his strokes properly to make him a more effective swimmer. As well as teaching children the correct swimming techniques – children also get to have some free swim and jumping in at the end. Though the lessons themselves are “fun” based – unlike the lessons we as parents perhaps remember as children ourselves! The groups are really small – usually around 4 in each group, so each child gets personal attention from the instructors, and they are taught according to their own ability, rather than the ability of others in the group – although the groups are put together according to age and ability. The instructors are really “child friendly” though know when to be strict when it’s appropriate – to ensure that the children make progress. The lessons seem to build on the children’s skills each week so that children clearly progress through a range of skills and strokes. There are badges and certificates when children achieve certain things which I think is a nice motivation! My boys both really enjoy their lessons and have really bonded with their instructors – which is really cute to see! 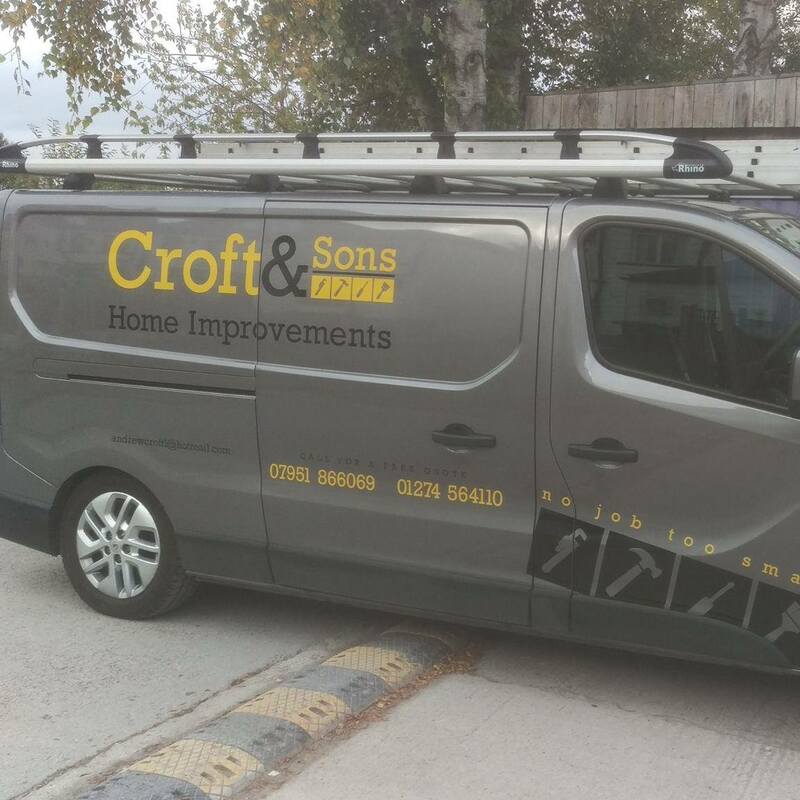 They really look forward to their lessons and as a parent I get a real sense of satisfaction from knowing that we’ve provided something for them that is going to last a lifetime. Swim Stars also run crash courses during the holidays which we’ve attended a few times. With this, children attend each morning for a week – I have to say that the progress during that week is incredible, which just goes to show how important regular swimming is. Lesson places are now currently available, and if you’re not signed up already, I really urge you to think about it. If you just pay for one thing for your child – this should be it. Swim Stars are a site sponsor of Bingley Mums, but all thoughts are my own.